Money in the Garage: José Carioca: not your average bird ! 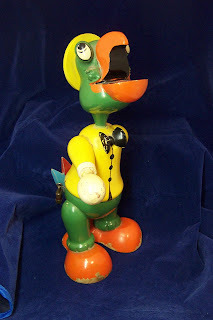 José Carioca: not your average bird ! Check out this vintage Disney toy bank that I found late one morning at a very busy neighborhood yard sale. I vaguely recognized this little guy as being a Disney cartoon character and was surprised that no one snatched him up earlier. The women who was selling him informed me he was one of her childhood toys. Based on that information, I figured the toy bank was probably from the late fifties or early sixties. He stood about a foot high and was marked " Walt Disney Enterprises". Disney stopped using that company name in 1968. I paid only $15.00 for him and took him home to begin some Google research. It took some time to identify him since he is not a major Disney character. I discovered he was José Carioca, a Disney cartoon parrot featured in many old Disney shorts and movies. He was widely known for his star turn in the classic 1943 film short "The Three Caballeros" along with Donald Duck and a Mexican rooster named Panchito Pistoles. After doing my research on the character, I wrote what I thought was a funny, informative description. As the week progressed I began to worry; the parrot sat for days with a high bid of only $12 dollars. This was three dollars less then what I paid for him! However there were a lot of people “watching” the auction...always a very good sign of buyer interest. Amazingly, as the auction concluded buyers kick into high gear. With only 8 seconds to go in the auction, the bird soared from $12 to $90. I love when that happens, it’s like watching your favorite stock go through the roof! The buyer was another EBay seller who deals only in antique toys. He ended up listing it in his Ebay store for $300! I don’t know if he ever got his price, but I got more then enough for Jose and moved on to my next deal! Momma Bear and Baby Bear.